Digital Marketing Training Course in Delhi, India. 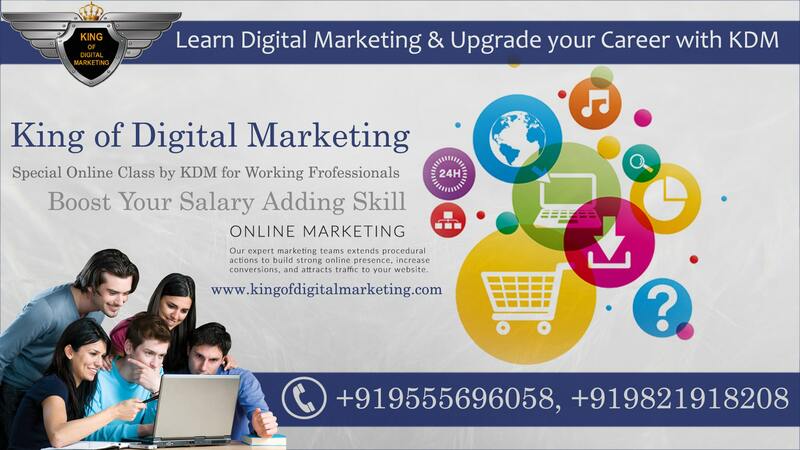 Get SEO SMO SEM Online and classroom training by industry experts through King of Digital Marketing located in Delhi. We are top ranked Digital Marketing Agency for Training and Services all over India and abroad. Here students learn to discover how to use search engine optimization for increasing the visibility of your website in major search engines like google, Bing, yahoo. We cover advance seo concept to rank your website. Learn practical + certification content of SEM & PPC including how to create a Search, Display, Shopping/Ecommerce, Video and Mobile Campaign from basic to advance level. Google Analytics will help you with great reporting tools for search/display advertising, ecommerce website and for mobile apps. Learn basic and custom reports creation from experts. SEO - Learn how search engine works, Keyword Research, on page optimization, title, description, meta tags, heading tags, anchor text, html & xml sitemap, alt tag, robots.txt, .htaccess. Local SEO - Learn how to optimizing for local listing, local audience and geo targeting. SMM - Learn the benefits of social media marketing for bard awareness using Facebook, twitter, LinkedIn and other smm websites. Email Marketing - We teach how to do good email marketing campaigns, email copywriting, email deliverability and more. Search Advertising - Learn how to get results using goggle AdWords search, Bing search marketing and increase your ROI. Mobile Advertising - Learn how to promote your apps and engage customer with your apps to increase your ROI. Shopping/Ecommerce Advertising - Promoting ecommerce website is entirely different from search and display advertising. Content/Behavioral Advertising - How to use content and behavioral marketing to attract and retain a defined audience. Google Analytics - Learn how to create Analytics account, collect data, KPIs, analytics dashboards, predictive analytics and navigate various reports to attract new users and increase revenue.